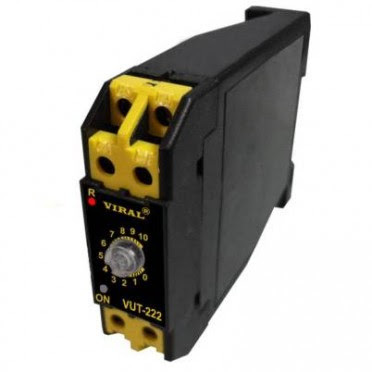 How to use Universal Voltage On Delay Interval Timer VUT-222 ????? Fuse links, Fuse Holders, Plastic Legend Plates, Push buttons, Neutral Links, Switches, Energy Meters, Digital Timers & Counters, Digital Meters & Temperature Controllers, Scrolling Display Sign Board, Process Indicators, Pilot Lamps, Adaption Plates for Digital Meters, Other Electronic Products. Micro controller Based Din Rail Timer. 2 functions, 12 ranges, Universal voltage . Type : 2 functions, 12 ranges, Universal voltage, ON Delay / Interval . Output : 2 C/O (DPDT) . Time Range : 1 / 3 / 10 / 30sec / min / hr . Input Voltage : 230 V AC, 12 V DC . 1. Cautious entry in different segment of instrumentation. 2. Growth and innovation from within is the anchoring point. 3. Firm expansion is the foundation builder. 4. Quality of service reflects the commitment. 5. Innovative Ideas paves the way for leaders. A voltmeter is an instrument used for measuring electrical potential difference between two points in an electric circuit. Analog voltmeters move a pointer across a scale in proportion to the voltage of the circuit; digital voltmeters give a numerical display of voltage by use of an analog to digital converter. A voltmeter in a circuit diagram is represented by the letter V in a circle. This meters were implemented in several counties like china, arab countries,etc.This is going to be the future of metering.This is going to help all countries in solving their energy problems. How to Use EAPL Hand Held LCD Tachometer DT2001B ???? 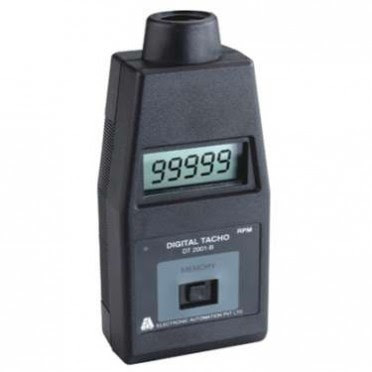 For More Details About EAPL Hand Held LCD Tachometer DT2001B : Click Here! A tachometer is an instrument measuring the rotation speed of a shaft or disk, as in a motor or other machine. The device usually displays the revolutions per minute (RPM) on a calibrated analogue dial, but digital displays are increasingly common. The word comes from Greek ta??? (tachos "speed") and metron ("measure"). Essentially the words tachometer and speedometer have identical meaning: a device that measures speed. It is by arbitrary convention that in the automotive world one is used for engine and the other for vehicle speed. In formal engineering nomenclature, more precise terms are used to distinguish the two. Micro-controller based design with world class Indian software. LCD display, Input sensing indication through LED. Accuracy: 1RPM up to 5,000 RPM and 0.05% of the reading above 5,000 RPM. Resolution: 0.1RPM up to 5,999 RPM and 1RPM at and above 6,000RPM. Calibration certificate provided along with tachometer - traceable to national and international standards. How to Measure Counts by Using Scrolling Display Sign Board VSB-427 ??? 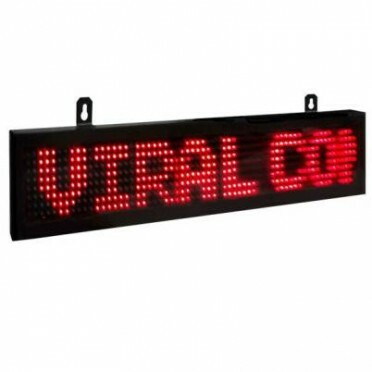 For More Details About Scrolling Display Sign Board VSB-427 : Click Here! Process Indicator VSB-427 are found many application, Sign Boards for product display & Rate indication in Shops & Commercial Centers,Scrolling Display with RS 232 Interphase & RTC. Micro Controller base LED Scrolling Displat. Display : 3 Digit Red LED. Input : 3 Phase 4 wire. Accuracy : of + 1% of FSD. Power Supply : 230V AC + 10% 50 Hz. Size : 100 X 675 X 25 mm . 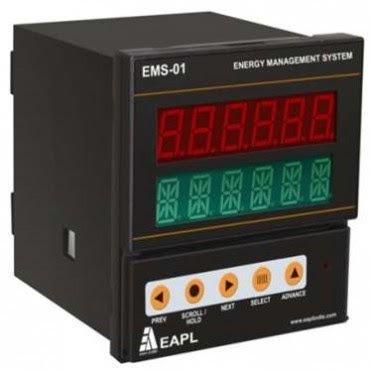 For More Details About EAPL Energy Meter With Pulse Output Optional EMS-10P : Click Here! Several groups had developed a laboratory prototype of Single-phase Prepaid Energy meter using a smart card based scheme. The energy measurement unit is based on a commercially available ASIC. A micro controller based control section controls and co-ordinates all the activities viz. reading the credit units from the card through the card reading mechanism, computing and updating the net credit, displaying the net credit on the LCD display, initiating various alarms and indications, and load disconnection / connection. This meters were implimentrd inseveral counties like china,arab countries,etc.This is going to be the future of metering.This is going to help all countries in solving their energy problems. Auto Scroll / Hold Facility, Pulse Output available. Application : Sub metering panels, Distribution Panels, HT/ LT panels, DG panels and RMU panels etc. 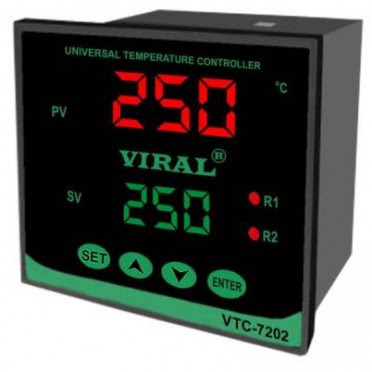 Temperature Controller VTC-7202 (Economy) are Temperature Controller (Economy) Double Display with Single Sensor. Ovens & Furnaces, Heat Treatments Shop, Plastic Machinery, Ceramic & Steel Industry, Accurate measurement of Temperature & its control. Multifunction-On-Dalay / Interval / Equal Cyclic-On / Equal Cyclic-Off programmable. 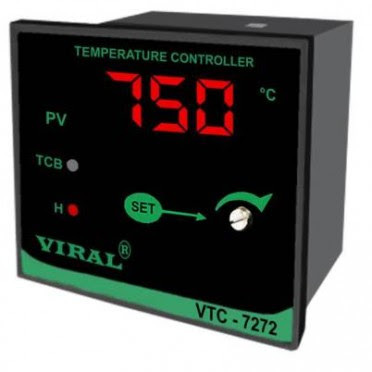 How to use Single Range Single Function Economical Timer VTR-60S ????? Single Range, Single Function, Economical . Type : Single Range, Single Function, Economical, 1 C/O(SPDT), ON - ON Delay. Output : 1 C/O(SPDT) . Time Range : 30S- 30sec, 60S- 60 sec Factory Set . 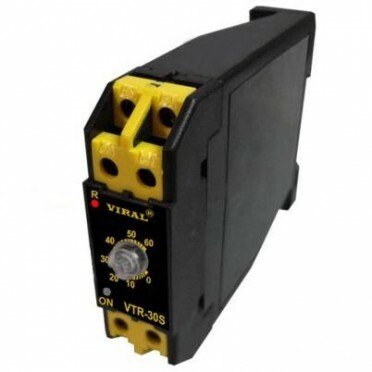 Input Voltage : 230 - 230 V AC, 12 - 12 V DC . The kilowatt-hour (symbol kWh,kW.h or kW. h) is a derived unit of energy equal to 3.6 megajoules. If the energy is being transmitted or used at a constant rate (power) over a period of time, the total energy in kilowatt-hours is the power in kilowatts multiplied by the time in hours. The kilowatt-hour is commonly used as a billing unit for energy delivered to consumers by electric utilities. Accuracy Class1.0 / (Class 0.5 calibration on Request). CT Pri/Sec Programmable, Digital Measurement, IEC Compliance. How to use Single Phase Frequency Meter VHZ-7272 ????? Single Phase Frequency Meter VHZ-7272 Frequency Meter 40 - 65 Hz. Dimension : 45 (W) X 75 (H) X 116mm (D). How to Measure Counts by Using EAPL VAF & PF Meter EMS-02 ??? 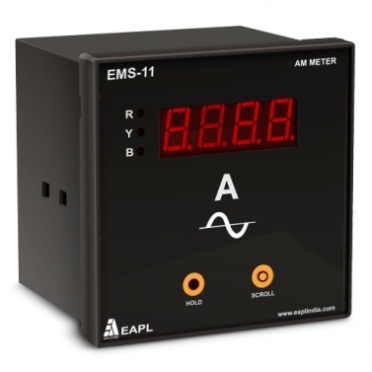 For More Details About EAPL VAF & PF Meter EMS-02 : Click Here! Several groups had developed a laboratory prototype of Single-phase Prepaid Energy meter using a smart card based scheme. The energy measurement unit is based on a commercially available ASIC. A microcontroller based control section controls and co-ordinates all the activities viz. reading the credit units from the card through the card reading mechanism, computing and updating the net credit, displaying the net credit on the LCD display, initiating various alarms and indications, and load disconnection / connection. 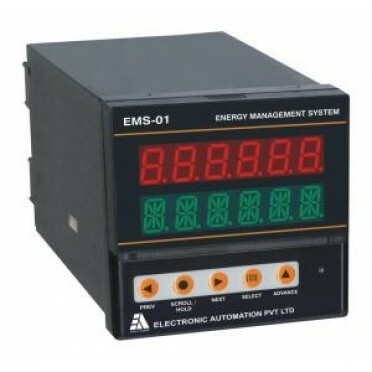 For More Details About EAPL Electronic Timer Optional B1DF-R 240V AC : Click Here! 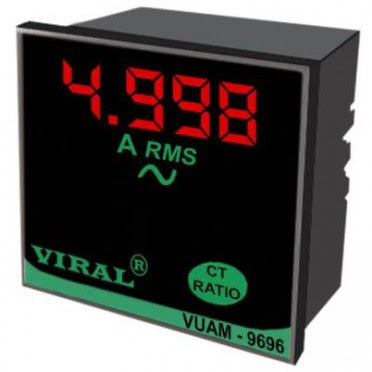 How to Measure Counts by Using Single Phase Voltmeter VVM-7272 ??? 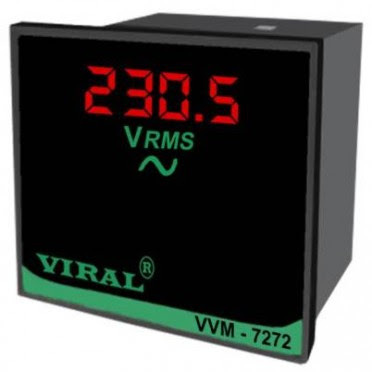 For More Details About Single Phase Voltmeter VVM-7272 : Click Here! Single Phase Voltmeter VVM-7272 are founded to application of Single Phase Voltmeter AC or DC 0-500V. How to use Single Range Single Function Economical Timer VTR-30S ????? How to use EAPL Electronic Timer SPP-T ????? Universal Timer VUT-9696 are Universal Timers 9999 Secs / Min / Hrs Selectable, Micro Controller based Timer. 1 or 2 Relay output as required on request. Applications : Timer Mesurement, Automation, Washing Machines etc. Display : 0.39”, 0.56” 7 - Segment Display. Upper RED 4 Digit shows Time. Lower GREEN 4 Digit shows Set Time. How to use Single Phase Ampere Controller VAC-9602 ????? Single Phase AC Ammeter VAC-9602 DC Ammeters 0-9000A DC (75mv Input. Shunt Selectable). How to use Single Phase AC Ammeter VUAM-9696 ????? How to Measure Counts by Using EAPL Time Switch TS-203 12VDC ??? 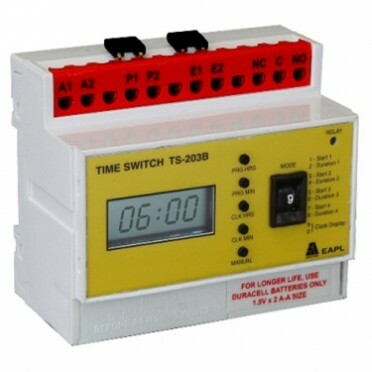 For More Details About EAPL Time Switch Optional TS-203 12V DC : Click Here! A time switch (also called a timer switch, or simply timer) is a timer that operates an electric switch controlled by the timing mechanism. 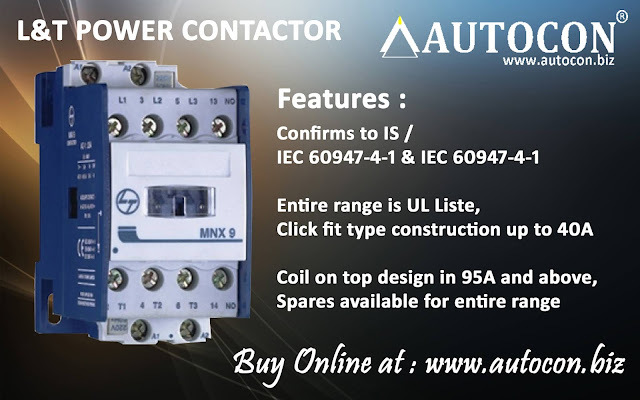 The switch may be connected to a electric circuit operating from mains power, including via a relay or contactor; or low voltage, including battery-operated equipment in vehicles. It may be built into power circuits (as with a central heating or water heater timer), plugged into a wall outlet with equipment plugged into the timer instead of directly into the power point; or built into equipment as, for example, a sleep timer that turns off a television receiver after a set period. For More Details About Single Range Single Function Economical Timer VTR-30S : Click Here!